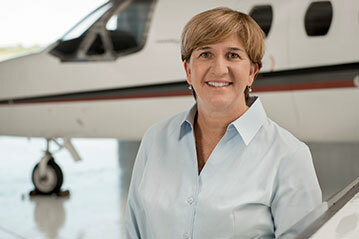 Karin Rassbach holds a Bachelor of Science degree in Aviation, and an Associate of Applied Science degree in Information Technology, from The Ohio State University. In addition, Karin is currently working on a Master's of Science degree in Leadership. Prior to joining the Heartland Aviation Team Karin spent two years at Executive Jet Aviation, where she flew the Citation SII and the Hawker 1000. In addition, Karin spent 16 years at Airborne Express as a DC-9 pilot. Karin took some time away from aviation when her children were young and became an IT Manager at Chippewa Valley Technical College. Karin has remained connected to CVTC over the years, and she is currently teaching online classes in Unmanned Aerial Systems (Drones). Karin is thrilled to be back in the air again flying the Citation II for Heartland and all of their great customers. When not flying, or attending her children's sporting events, Karin enjoys spending time at the lake with family and friends, and cooking while listening to some Jimmy Buffet or Bruce Springsteen tunes.